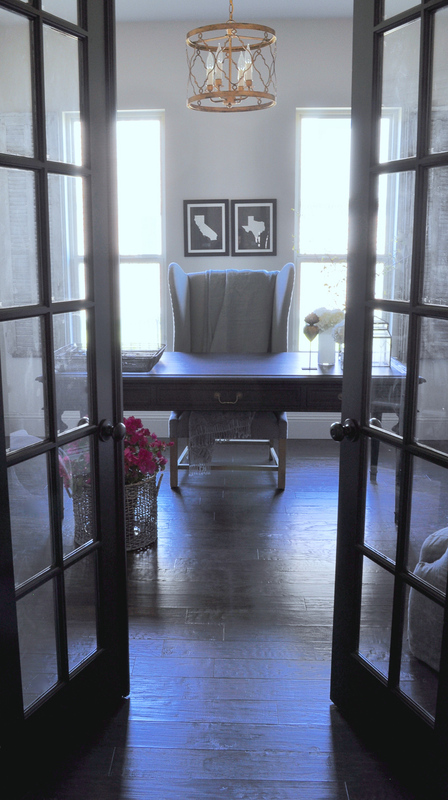 Today, I want to share our home office with you. It is one of my favorite rooms in our home. Located just off the foyer prior to arriving at the dining room, this flexible space offers our family a room for everything from daily computer activities to the annual Christmas present wrapping station. 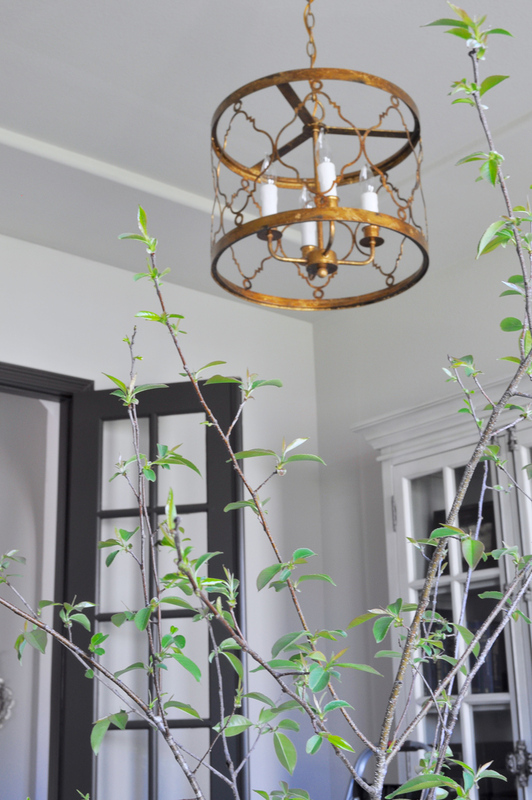 A couple of details you may notice: I had the builder paint the doors a rich black, otherwise they would be the traditional “builder white.” Additionally, right after we moved in I changed out the stock light fixture and replaced it with a gilded gold hanging fixture. 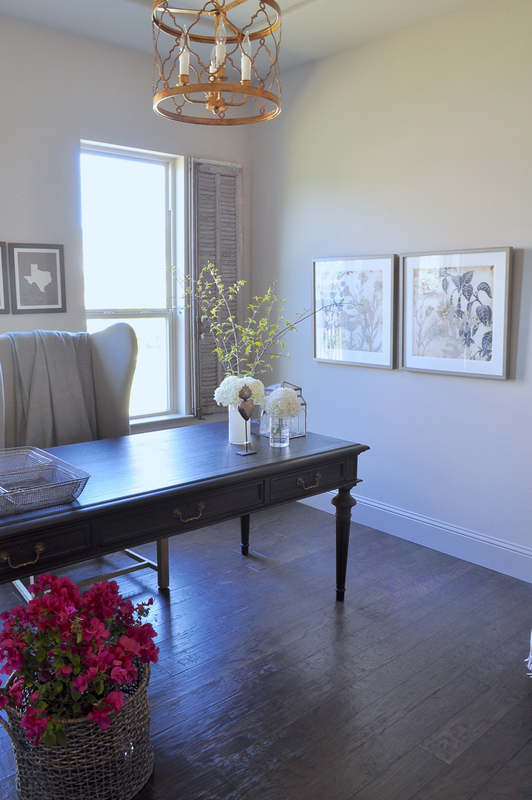 These two changes set the stage for the room’s personality. It offers a boldness and a touch of masculinity which is offset and complimented by some details which I would love to point out. 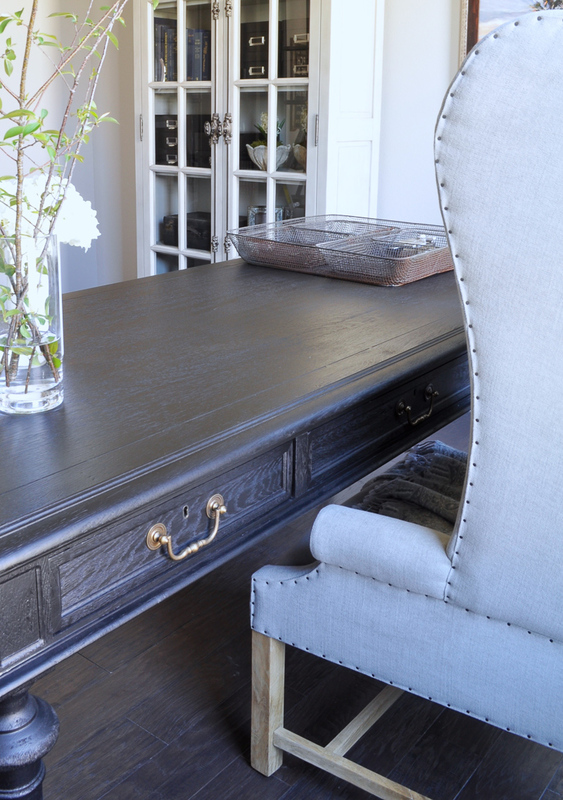 The desk is the star of the room. It is large enough for the space yet not too overbearing. Essentially, it fits the space perfectly. It is complimented by a large chair which is needed to soften the space. 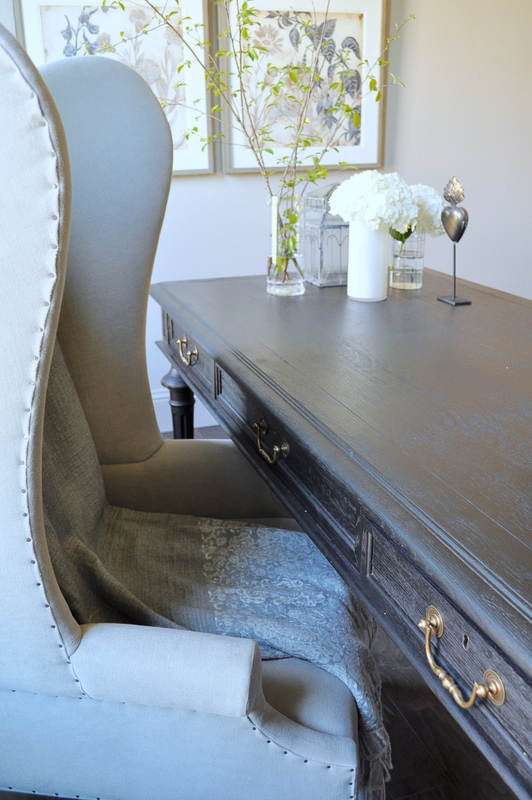 With the floor and desk being composed of wood, the chair’s gray linen fabric works perfectly in this space. Perhaps you noticed the brass handles on the desk. 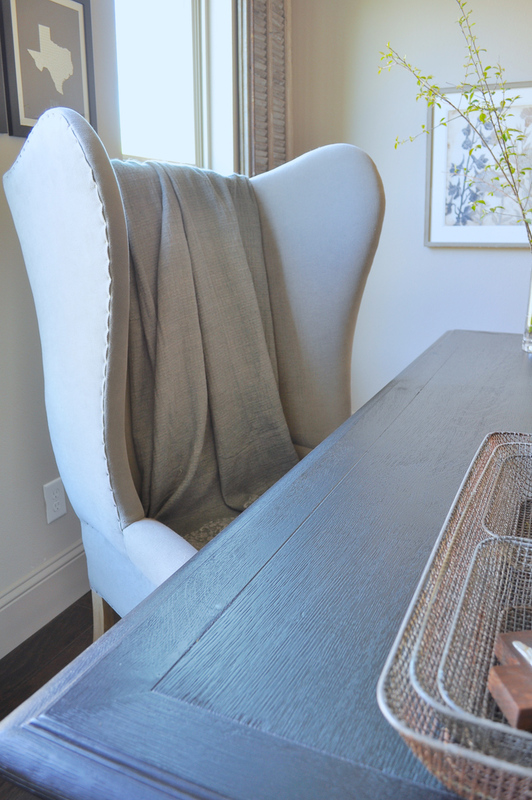 The light fixture’s color and material pull this subtle detail from the desk. The home office had the option for a built-in book case. 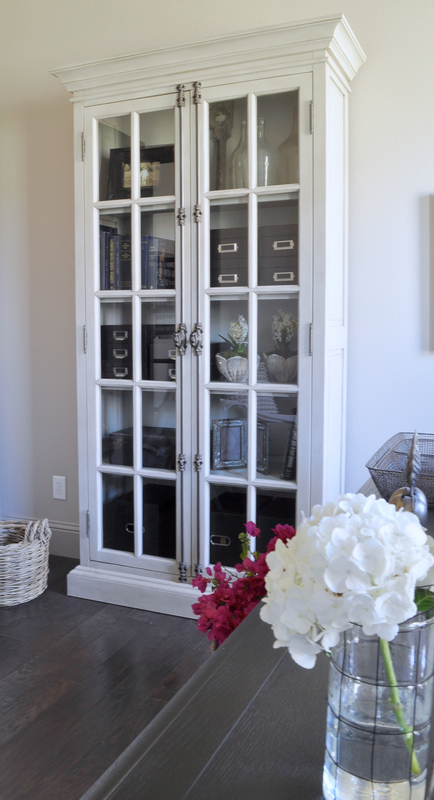 Rather than opt for that through the builder, I found this incredibly beautiful and functional cabinet which I felt reflected the design personality of this room. Notice the details of the elongated handles? 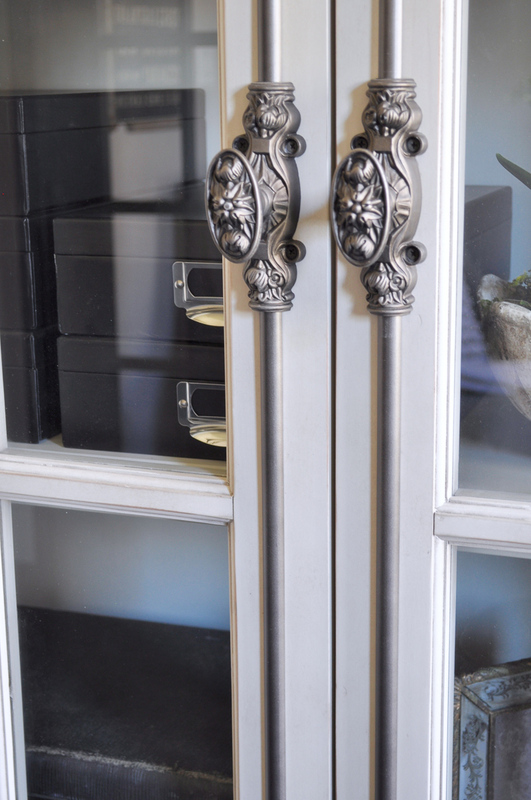 Behind the desk and framing the windows, you will notice a pair of vintage chipped paint shutters, complete with original hardware. 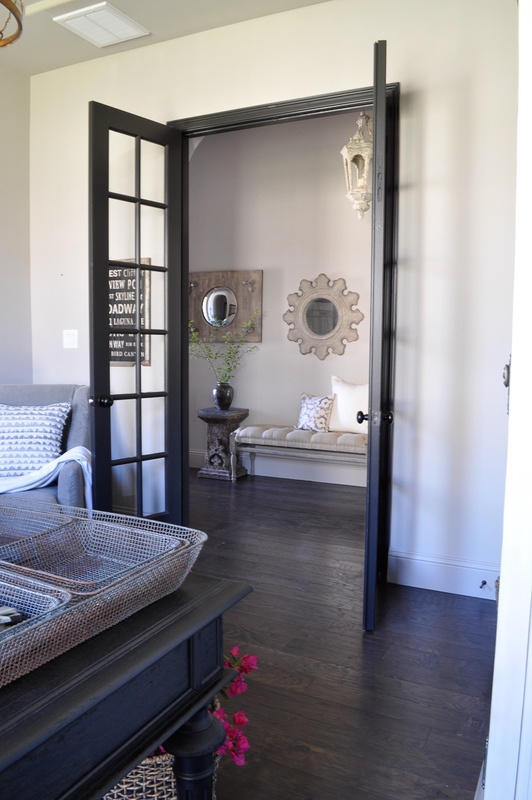 Keeping with the fabric theme of the room, in the corner is a smaller gray linen chair for guests. From the desk, you have a view of a number of the foyer’s details, including the tufted linen bench, hanging fixture, and accent mirrors. You can see a full tour of the entry hall here. It is my sincere hope that the images shared here inspire you to make changes to your own home office which you might have been considering. It is such a fun room to design and decorate. I hope you enjoyed this room tour and thank you so much for visiting! 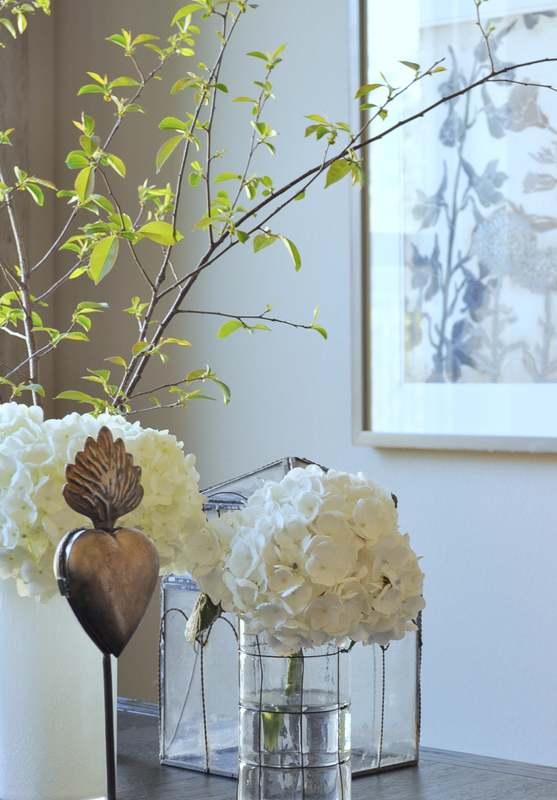 Please consider subscribing to Decor Gold Designs! Some affiliate links were used. The room is so beautiful! 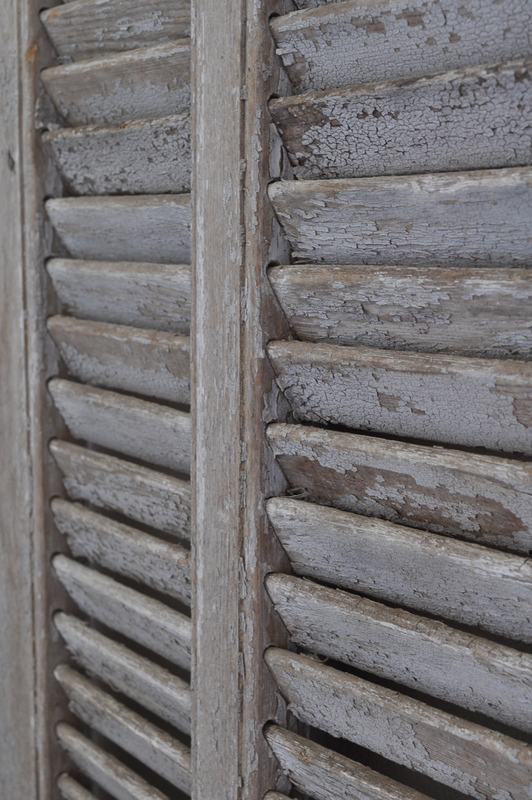 I just the love the wonderfully crusty shutters! Thank you so much Lisa! Believe it or not, my husband actually found the shutters! do you happen to have source for state prints? Thank you Kate! I purchased the state prints from One Kings Lane a couple of years ago. I don’t have a new source yet, but I am looking. I promise to publish a source as soon as I have one. Thanks so much for visiting! Such a beautiful space! 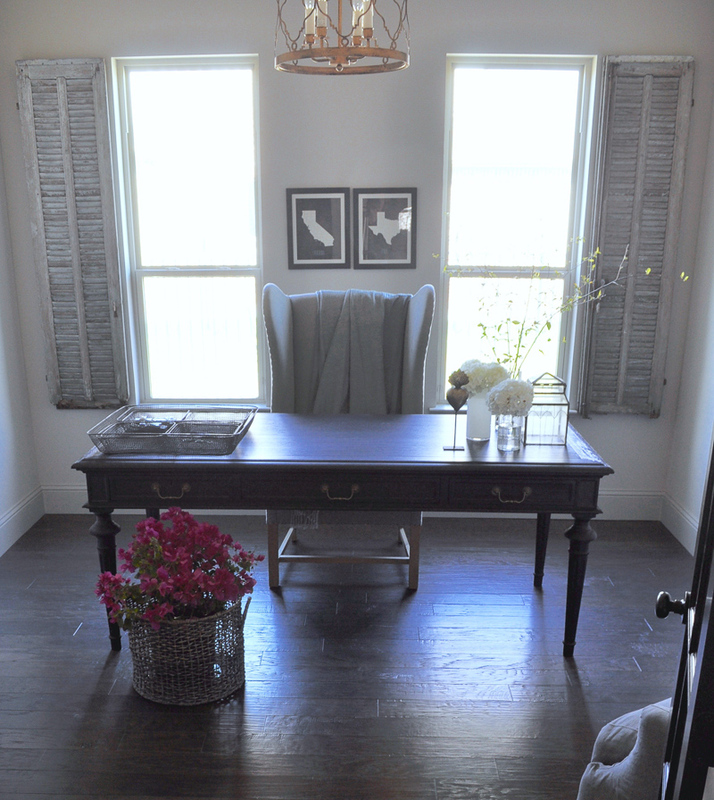 The one thing you didn’t mention were the two pictures on the wall – representing CA + Texas! I love this… I’ve thought about doing this down the hallway (to the kids rooms) for each of the places we were born: Jax/I = WA, Bryan = TN, Lexie = AZ, Adoption kiddos = Haiti… and now you’ve inspired me to do it! It’s perfect!!! You are right…I had a few comments in the post about them, but I deleted them because I’ve been unable to find a new source. I love your idea and ours represent the exact same thing. Thanks so much for your kind words. Now you can see where I usually am when I’m working on the blog or getting educated by my favorite marketing bff!!! Beautiful Jennifer! Love this office ! What a stunning office! Love all the subtle details that tie in everything together! Thank you so much!!! How nice of you to leave a comment! Where can I purchase those shutters? Hi Sandy! Thanks for visiting! The shutters are vintage…sorry! Hi Jennifer – This is just a beautiful space! 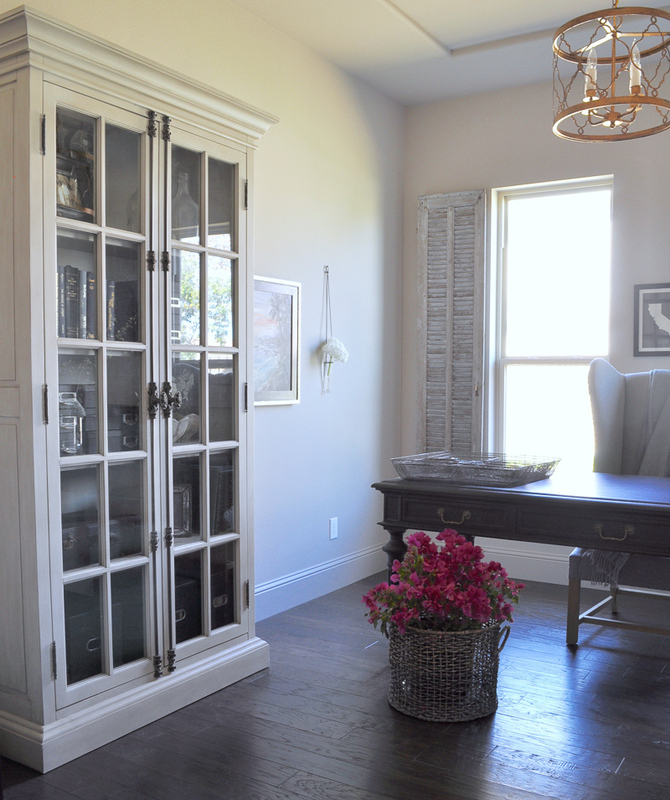 I have the exact same French Casement Cabinet from RH and find that the taupe color gives off a bit of a yellowish tint and I think it may be due to my paint color . I’ve read that your paint color was custom, but I’m curious if you have a recommendation on a paint color to help eliminate the yellow hues. I appreciate the feedback! Beautiful room!! Can u tell me the dimensions of the room and the hall way out side the room. I have a big living room that I’m looking to close off into a study but i don’t want to close off the entire thing just half and leave a hall way right outside French doors. Your set up is so beautiful I would like to try to do something similar and I’m not sure if it’s possible. Thanks in advance for the dimensions! Thank you! 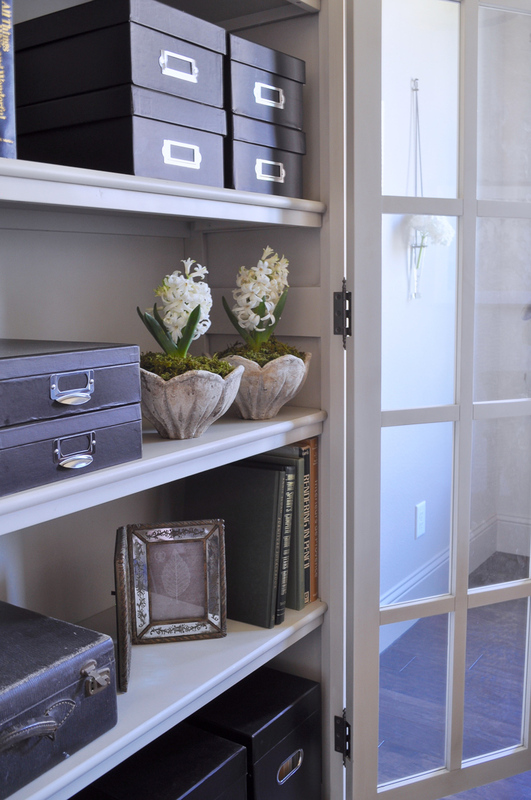 The hallway is 6′ wide and the home office is approximately 11’x 11′. Good luck with your project! Is that the 79″ or the 60″ partners desk? Hi Jennifer, firstly your house is Gorgeous!! Yes, that’s with a capital G. Especially the kitchen, I was looking for something other than a white kitchen but something that felt modern and airy; your kitchen is just perfection!! The flooring I think is a perfect complement for the colors you used, can you provide any details on the flooring you used? Color and make. Hi Preethi! Thank you! I wish I could help you, but our builder provided the flooring. During the construction of our home 5 years ago, it was actually discontinued. Perhaps you can take a picture of mine or another one you like to a flooring center in hopes of finding something similar.